Football means nothing. It is a fantastic game, and its symbolic complexity allows individuals and groups (and researchers!) to project a lot of things onto it, but it does not carry any deep meaning as such. As Borja Garcia never tires of pointing out, football makes people happy precisely because it’s a futile thing and a provider of profoundly social events. Just like rock music in a Paris theatre, or other forms of trivial entertainment. Which is exactly why ideological fanatics hate it so much. The other reason why the Stade de France was a target for the terrorists on Friday night is the fact that football brings together such a large number of people in a relatively small place. Shared moments of futile amusement is probably what makes a city ‘the capital of abomination and perversion’, as the terrorists described Paris. 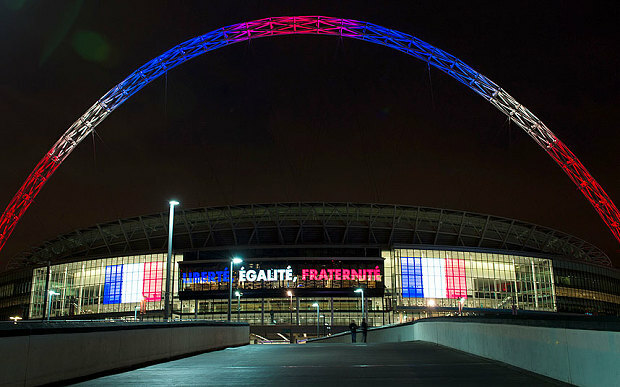 Which is exactly why it makes sense to play the England-France in Wembley tonight, even though nobody really feels like playing. The match will be a cathartic moment for a very large number of people after three days of shock and silence. It will allow the spectators to somehow publicly manifest their solidarity as representatives of a free Europe and simply as friends. Over the last three days, so many individuals have helplessly repeated in front of cameras and microphones that the only thing to do now was ‘carry on with our lives’. The Wembley match is a symbolic, large-scale confirmation of this attitude. And the players, these spoilt brats of the entertainment industry, who would of course all have liked to go home to their families and digest this night in the catacombs of the Saint-Denis arena, have intuitively understood that they have an eminently social role to take. Neither the French players nor their German counterparts, who will play an entirely meaningless match against the Netherlands, seem to have hesitated. Both England vs. France and Germany vs. Netherlands are among the fiercest rivalries of football history. Normally, a lot of prestige is at stake. Tonight, no one will think about rivalry and prestige, and the term ‘friendly’ will all of a sudden make sense. Just a shared moment of football, so futile, so necessary. Does Europe need a sport diplomacy? This entry was posted in Current Affairs, Society & Culture and tagged Football, France, Paris. Bookmark the permalink. Next: Does Europe need a sport diplomacy? These 'European throw-ins' stem from the work of the FREE project (www.free-project.eu) which seeks to understand the impact of football on identity dynamics, perception patterns and cultural change in contemporary Europe. Unless otherwise indicated the posts of this blog are thrown in by Albrecht Sonntag, from the EU-Asia Institute at ESSCA School of Management, Angers.